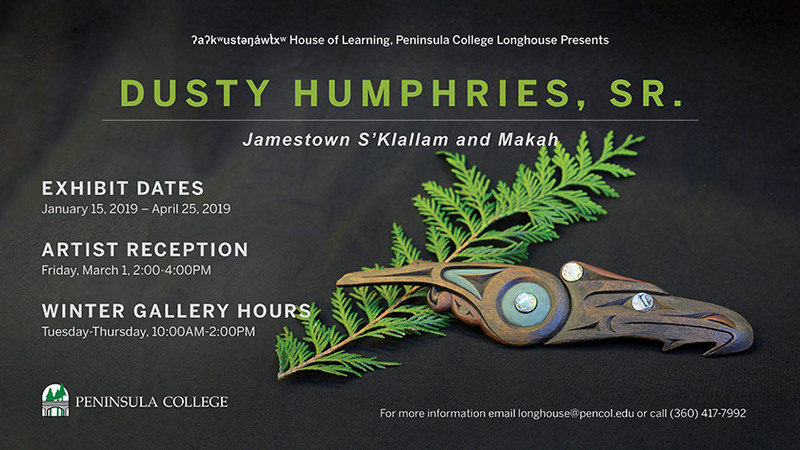 Artwork by Dusty Humphries, Sr. of the Jamestown S’Klallam and Makah Tribes will be on display in ʔaʔkʷustəŋáw̕txʷ House of Learning, Peninsula College Longhouse until April 25, 2019. An artist reception will be Friday, March 1, 2019 from 2:00 pm – 4:00 pm in the Longhouse. All are welcome. Winter gallery hours are Tuesday – Thursday, 10:00 am – 2:00 pm. For more information, contact longhouse@pencol.edu or (360) 417-7992.